AppSync is a potentially unwanted program that installs programs on to your computer. These programs include other adware, unwanted extensions, and potentially more malicious malware. 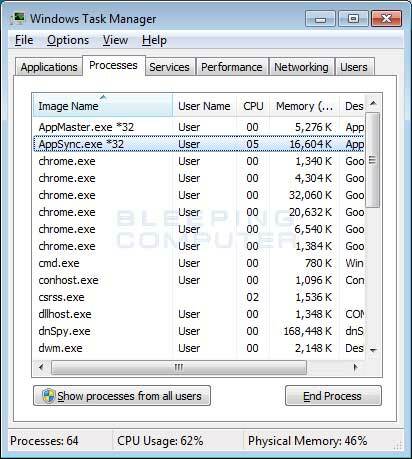 When running, it will appear in the Task Manager as appsync.exe. This PUP does not include its own uninstall method and need to manually remove it. How was AppSync installed on my Computer? It is important to note that AppSync is typically bundled with and installed by free programs that did not adequately disclose that other software would be installed along with it. Therefore, it is important that you pay close attention to license agreements and installation screens when installing anything off of the Internet. If an installation screen offers youÂ CustomÂ orÂ AdvancedÂ installation options, it is a good idea to select these as they will typically disclose what other 3rd party software will also be installed. Furthermore, If the license agreement or installation screens state that they are going to install a toolbar or other unwanted adware, it is advised that you immediately cancel the install and not use the free software. If you are not sure how AppSync was installed on your computer, then it most likely was installed via an adware bundle. As this program is installed without your permission, connects to remote sites without your permission, and perform unknown activities, it is suggested that you remove it. To remove AppSync you can use the removal guide below to remove it for free. To terminate any programs that may interfere with the removal process we must first download the Rkill program. Rkill will search your computer for active malware infections and attempt to terminate them so that they wont interfere with the removal process. To do this, please download RKill to your desktop from the following link. When at the download page, click on the Download Now button labeled iExplore.exe. When you are prompted where to save it, please save it on your desktop. Once it is downloaded, double-click on the iExplore.exe icon in order to automatically attempt to stop any processes associated with AppSync PUP and other malware. Please be patient while the program looks for various malware programs and ends them. When it has finished, the black window will automatically close and a log file will open. Please review the log file and then close so you can continue with the next step. If you have problems running RKill, you can download the other renamed versions of RKill from the rkill download page. All of the files are renamed copies of RKill, which you can try instead. Please note that the download page will open in a new browser window or tab. MBAM will now start and you will be at the main screen as shown below. We now need to enable rootkit scanning to detect the largest amount of malware and unwanted programs that is possible with MalwareBytes. To do this, click on the Settings button on the left side of the screen and you will be brought to the general settings section. Now click on the Protection tab at the top of the screen. You will now be shown the settings MalwareBytes will use when scanning your computer. At this screen, please enable the Scan for rootkits setting by clicking on the toggle switch so it turns green. When MBAM is finished scanning it will display a screen that displays any malware, adware, or potentially unwanted programs that it has detected. Please note that the items found may be different than what is shown in the image below due to the guide being updated for newer versions of MBAM. You should now click on the Remove Selected button to remove all the selected items. MBAM will now delete all of the files and registry keys and add them to the programs quarantine. When removing the files, MBAM may require a reboot in order to remove some of them. If it displays a message stating that it needs to reboot, please allow it to do so. Once your computer has rebooted, and you are logged in, please continue with the rest of the steps. When Zemana has finished finished scanning it will display a screen that displays any programs that have been detected. Please note that the items found may be different than what is shown in the image below. Review the scan results and when you are ready to continue with the cleanup process, click on the Next button to delete or repair all of the the selected results. Once you click on the Next button, Zemana will remove any unwanted files and fix any modified legitimate files. If you receive a warning that Zemana needs to close your open browsers, please close any web browsers that may be open and then click on the OK button to continue. Zemana will now create a System Restore Point and remove the detected files and repair any files that were modified. When AdwCleaner has finished downloading, please double-click on the AdwCleaner.exe icon that now appears on your desktop. Once you double-click on the icon the AdwCleaner program will open and you will be presented with the program’s license agreement. After you read it, click on the I agree button if you wish to continue. Otherwise, click on the I disagree button to close the program. If Windows prompts you as to whether or not you wish to run AdwCleaner, please allow it to run. If you selected to continue, you will be presented with the start screen as shown below. Now click on the Scan button in AdwCleaner. The program will now start to search for known adware programs that may be installed on your computer. When it has finished it will display all of the items it has found in Results section of the screen above. Please look through the results and try to determine if the programs that are listed contain ones that you do not want installed. If you find programs that you need to keep, then uncheck the entries associated with them. For many people, the contents of the Results section may appear confusing. Unless you see a program name that you know should not be removed,please continue with the next step. To remove the adware programs that were detected in the previous step, please click on the Clean button on the AdwCleaner screen. AdwCleaner will now prompt you to save any open files or data as the program will need to close any open programs before it starts to clean. Please save your work and then click on the OK button. AdwCleaner will now delete all detected adware from your computer. When it is done it will display an alert that explains what PUPs (Potentially Unwanted Programs) and Adware are. Please read through this information and then press the OK button. You will now be presented with an alert that states AdwCleaner needs to reboot your computer. You will now be at the HitmanPro setup screen. If you would like to install the 30 day trial for HitmanPro, select the Yes, create a copy of HitmanPro so I can regularly scan this computer (recommended) option. Otherwise, if you just want to scan the computer this one time, please select the No, I only want to perform a one-time scan to check this computer option. Once you have selected one of the options, please click on the Next button. HitmanPro will now begin to scan your computer for infections, adware, and potentially unwanted programs. When it has finished it will display a list of all the items that Hitman has found as shown in the image below. Please note that the items found may be different than what is shown in the image. You should now click on the Next button to have HitmanPro remove the detected items. When it is done you will be shown a Removal Results screen that shows the status of the various programs that were removed. At this screen you should click on the Next button and then if prompted you should click on the Reboot button. If HitmanPro does not prompt you to reboot, please just click on the Close button. Once your computer has has restarted or you pressed the Close button, you should now be at your Windows desktop. Your computer should now be free of the AppSync PUP program. If your current security solution allowed this program on your computer, you may want to consider purchasing the full-featured version of Malwarebytes Anti-Malware to protect against these types of threats in the future. While Malwarebytes Anti-Malware, Zemana AntiMalware & HitmanPro will scan and clean a computer for free, the free versions do not offer real-time protection. If you want to be fully protected at all times then it is recommended that you purchase a premium version. Purchase the full-featured version of Malwarebytes Anti-Malware, which includes real-time protection, scheduled scanning, and website filtering, to protect yourself against these types of threats in the future! Purchase the full-featured version of Zemana AntiMalware, which includes second opinion malware scanner when other solutions do not work, cloud scanning, and super-fast scan time, to protect yourself against these types of threats in the future! Purchase the full-featured version of HitmanPro, which includes discover viruses, trojans, rootkits, spyware and other malware on up-to-date and fully protected computers using cloud protection and behavioral detections, to protect yourself against these types of threats in the future! Disclaimer: While we do earn a commission from the sale of the above products, rest assured we only recommend them due to their effectiveness. Great write-up, I am regular visitor of one¦s website, maintain up the nice operate, and It’s going to be a regular visitor for a lengthy time.